The interdependence of electricity and natural gas is becoming a major energy policy and regulatory issue in all jurisdictions around the world. The increased role of gas fired plants in renewable-based electricity markets and the dependence on natural gas imports make this issue particular important for the European energy market. 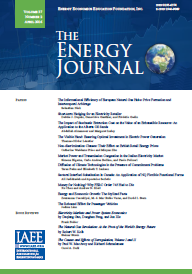 In this paper we provide a comprehensive combined analysis of electricity and natural gas infrastructure with an applied focus: We analyze three different scenarios of the long-term European decarbonization pathways, and analyze the interrelation between electricity and natural gas markets on investments in the long run and spatial aspects in the short run. Published in Volume 37, Sustainable Infrastructure Development and Cross-Border Coordination of The Quarterly Journal of the IAEE's Energy Economics Education Foundation.